Canon PowerShot G1X II sensor review: Strong contender? Announced in February 2014, the G1X II is a significant revision of the G1X from early 2012. Like its predecessor the G1X II has an unusually large CMOS sensor – a 1.5” type, which is somewhere between Four Thirds and APS-C – the largest currently used in a compact camera with a fixed zoom. Canon has taken an unusual route with a large sensor and lowered the pixel count slightly from 14-Mpix in the G1X to 12.8-Mpix in the Mark II. They’ve also revised the body, removing the optical viewfinder completely while using the opportunity to add an optional 2.36-M dot tilting EVF as a $299 extra. To the rear Canon has added a tilting 1.04-M dot touch screen LCD, while at the front the G1X II has a much more attractive zoom. Like its sibling, the zoom is stabilized but has a new wider 24-120mm range of focal lengths (up from 28-112mm equiv,) and a 1-stop brighter f2-3.9 maximum aperture (from f2.8-5.8). Given the camera’s potential for video, features seem a little underpowered with the new model offering 1080p at just 30fps only. 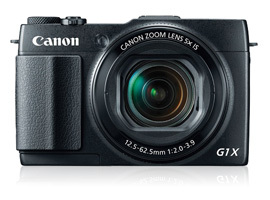 The Canon G1X II measures 4.6 x 2.9 x 2.6″ (116.3 x 74.0 x 66.2mm) and weighs 1.22 lb (553g). It is available now at $799. 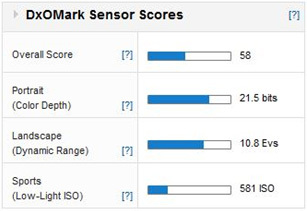 The Canon G1X II achieved a DxOMark a slightly discouraging score of 58 points, somewhat behind the 1” type BSI CMOS in Sony’s Cyber-shot DSC-RX100 II at 67 points and the best Four-Thirds devices. Neither the color depth, nor dynamic-range can quite match them, although perhaps unsurprisingly it is ahead of the firm’s PowerShot G16 and S120 compacts and rivals such as the Nikon Coolpix P7800, particularly with regard to low-light capabilities. The relatively low dynamic range of 10.8 Evs at base ISO is rather unexpected but it’s somewhat deceiving as it’s relatively consistent to ISO400 (10.42 Ev) and remains very good even at high ISOs. At $799 (plus $299 for the EVF) the G1X II has to compete with some strong contenders particularly the Micro Four Thirds models with interchangeable lenses. At $699 body only the Olympus OM-D E-M10 has a built-in EVF, albeit 1.4M dot and you’ll have to budget for a lens but the sensor has enhanced color discrimination and +1.5Evs wider dynamic range at base ISO (and higher, though they’re similar from ISO1600 onwards). It also has slightly better low-light capabilities. 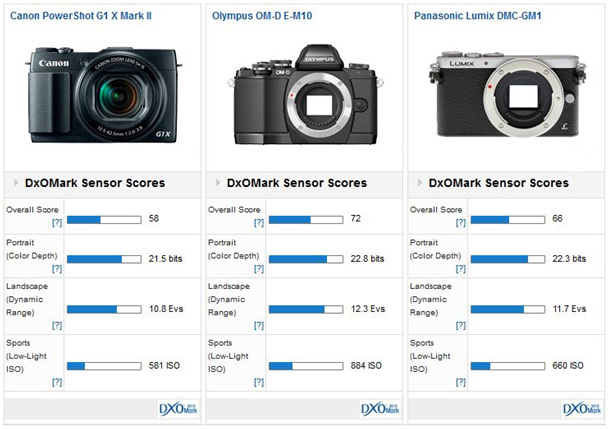 At first sight, the sensor performance of the G1X II doesn’t look particularly exciting with relatively low scores for color, DR and low light but a more careful look at the performance reveals that the G1X II is in fact a strong performer at high ISOs. When set to ISO800 and more, color and DR are much more competitive, but why Canon couldn’t tweak the performance at base ISOs is somewhat puzzling. Be that as it may, the G1X II as a whole remains a tempting choice for enthusiasts, even if, at $799 plus $299 for the EVF, it looks on the pricey side.